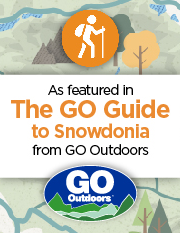 This is one of the shortest walks to be detailed on this site, however it covers the two highest mountains in the Glyders (Glyder Fach and Glyder Fawr) as well as having good views to the Snowdon Range, the Carneddau and Anglesey in good weather. The ground is generally rocky, and care may be needed when it is wet, since the route up the Devil's Kitchen becomes slippery. Begin at Idwal Cottage, on the A5 near Llyn Ogwen, and take the path going up by the information boards to the left of the shop. Follow this path around to Llyn Idwal. Cwm Idwal is a national nature reserve, and one of the few places in Britain where the Snowdon Lilly can be found. It is an area to be treated with extra special respect. It is an area which is home to lots of wildlife. From here take the path which goes round to the left of the lake, past some steep rock on the left. This is Idwal slabs, and it is very popular with rock climbers. The path will continue round, and start to go gently upwards. You will come to a stream, which is usually easy to cross, however after a lot of rain it may be more difficult. You will soon see a "chimney" up to the left. This is the Devil's Kitchen. It is named because it looks like a chimney, and in olden days when there was cloud on the mountains it looked like smoke coming out of the chimney, and it was said that it was the devil cooking. You will not be heading up the Kitchen itself, rather take the path which goes up to the left of the Kitchen. The ground at the beginning of this is quite slippery when wet. At the top of this path you will find yourself by a small lake called Llyn y Cwn. To your left is a steep scree slope, and to the right is the summit of Y Garn. Take the scree slope, which will take you to the summit of Glyder Fawr. From the Glyders you have a good view over to the Snowdon Range, as well as Tryfan and the Carneddau. You have now done most of the hard work. Follow the fairly well marked path across to Glyder Fach. Just before the summit you will pass the Castle of the Winds, and then you will reach the Cantilever. This overhanging stone can withstand the weight of a group standing on it, and if you feel energetic enough you could attempt some chin-ups!! To keep this route easy, do not leave the Glyder to the North, which heads down Bristly Ridge to Bwlch Tryfan. This steeper scramble is best kept for a more challenging ascent. Carry on to the East down a slope becoming grassy which will cross the old Miners Track. Before following the track NW to Bwlch Tryfan it is worth going on another 150m to see Tryfan from Llyn Caseg-fraith. This is the classic postcard view of Tryfan from the Glyderau. From Bwlch Tryfan follow the clear path down to Llyn Bochlwyd. Looking at it from above, it may appear to look like Australia, which is where it gets its alternative name (Lake Australia) from. Now just follow the path down by the river leaving the lake, back to Idwal Cottage.